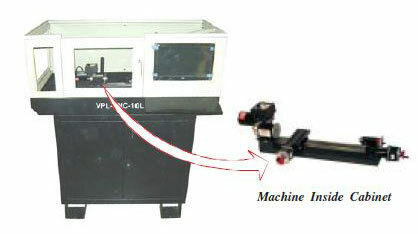 We are a major CNC Milling Machine (VPL-CNC-10L) Exporter & Supplier in India. CNC Milling Machine available With Cabinet. Spindle nose thread : 3/4"-16 T.P.I . Taper of tailstock spindle : #0 Morse. Motor : 90 Volt DC, input 220V/50Hz. Spindle speed range : 70-2800 RPM. It has mechanical storage system on the bottom for Computer system, Controller and for Electrical wiring. The system supplied with PC with Intel Pentium-IV CPU @ 2.4 GHz, 512MB RAM, 52X DVD Writer, Optical Mouse, 15 TFT Monitor & Keyboard.